For the most part, most Brits still haven’t quite got the hang of tapas. To many, the idea of spending an evening traipsing between different bars for glasses of sherry and a plate of ham here, some croquettes there, a prawn, octopus tentacle or a spicy chicken thigh there — is something to be reserved for Spanish holidays. It requires a city to have a critical mass of places set up this way, which rules out Newcastle. It’s a great shame, for in many ways the city centre is made for gastro-perambulation. Here’s a plea: can someone please open a couple of proper ham and sherry joints? I’ll happily perambulate between them all night if you do. Thanks in advance. In the absence of the real deal, our current experience of local tapas involves plonking yourself down for the entire evening and ordering a truck-load of small plates, which you then ply through with copious glasses of wine. This rather turns the concept on its head. All of a sudden, instead concentrating on getting a few things perfect, a kitchen has the hard task of doing lots of things well. As a result, most don’t succeed. Nowadays tapasification (a word I shall copyright) doesn’t have to be Spanish. 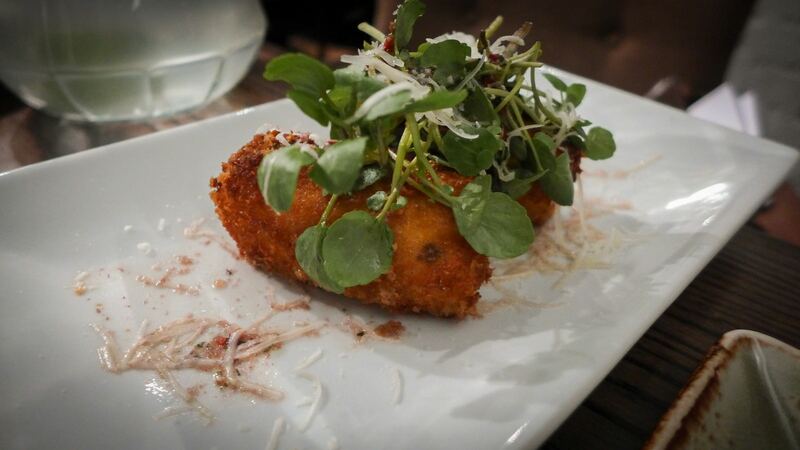 In London there are tapas versions of Peruvian, North African, Italian and so on. In Newcastle, they’ve gone one better. 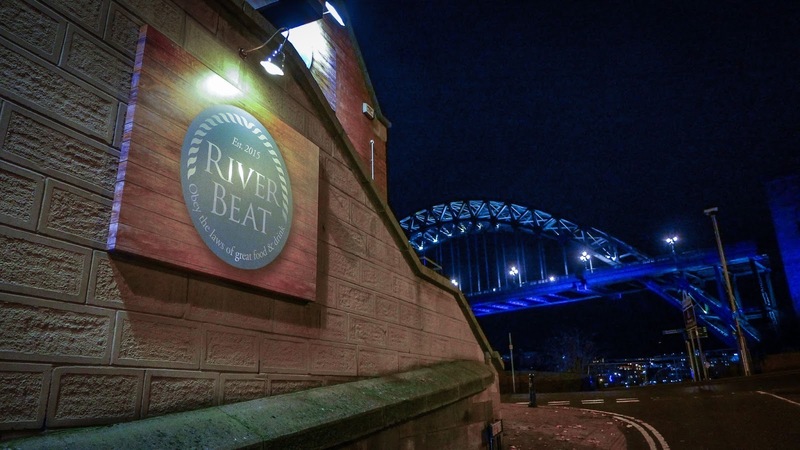 River Beat, tucked next to the Swing Bridge on the Gateshead side, has given the small plate treatment to Thai. Well, sort of. It’s not actually Thai, but a pan-Asian-influenced assortment. However, in what is quite a nifty move, all 22 dishes on their “tapas” menu are available in small or large plates, meaning you can eat pretty much whatever you want, however you want. Joined for the evening by Mrs Diner’s brother, it took us some time to figure out how to attack the menu. Curiosity called for as many small plates as seemed polite, to judge what the kitchen was up to. As a result, we ordered far too much. We got off to a false start. 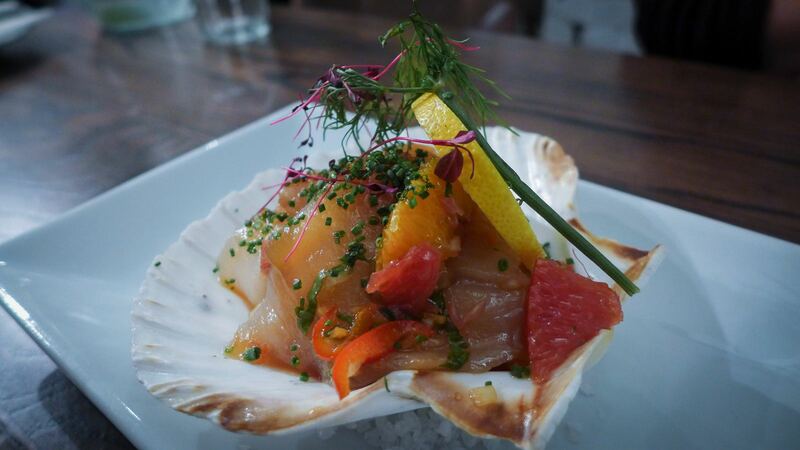 A scallop shell was filled with a ceviche of its former resident, along with some monkfish. This should have been a winner, but something had gone badly wrong: the pink grapefruit marinade had all the fruit’s bitterness but none of the bracing acidity on which ceviche relies. Much better were platefuls of fried things. 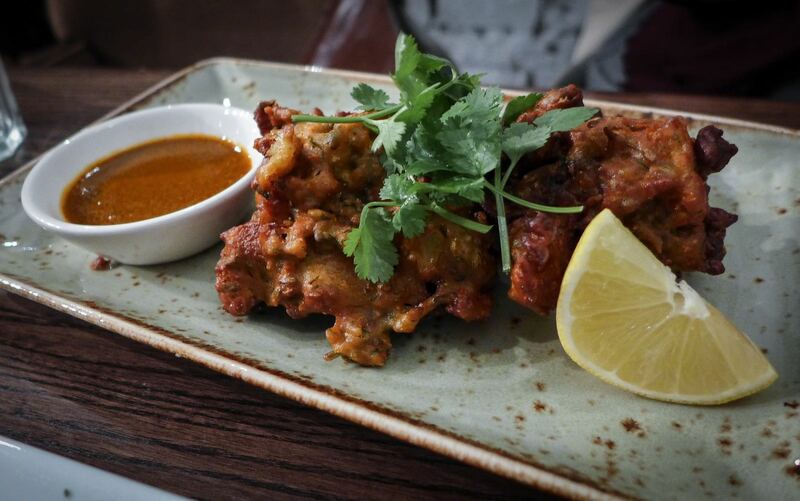 Cauliflower fritters were well spiced and partnered with a vindaloo dip whose vinegar tang was a reminder of what that much-abused dish is actually meant to be. 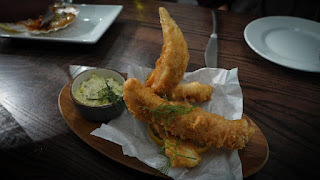 Goujons of hake were fried to crisp, greaseless perfection in a dandelion and cumin batter and made excellent vehicles for a tartare that was properly ripe with capers. Not everything emanating from the fryer was quite so sharp. Some decidedly non-Thai croquettes of goats cheese were a bit on the claggy side and had lost their bois boudran sauce (tomato ketchup with a touch of Michel Roux) en route to the table. 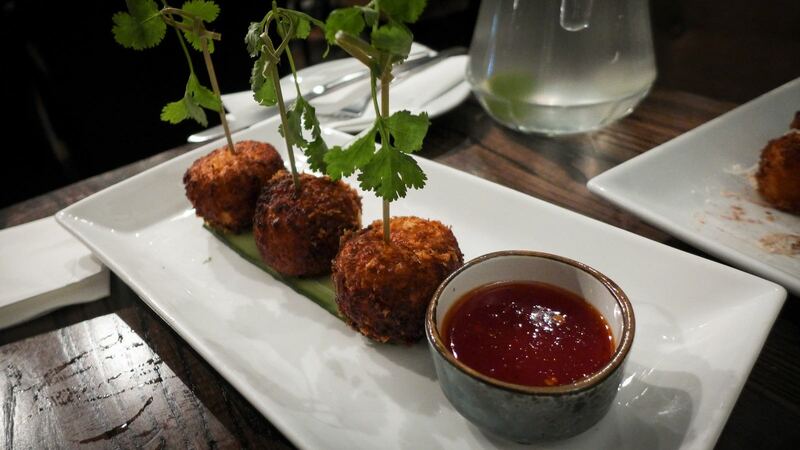 Meanwhile the advertised flavours of sake and apple were absent from some rather mediocre fishcakes. 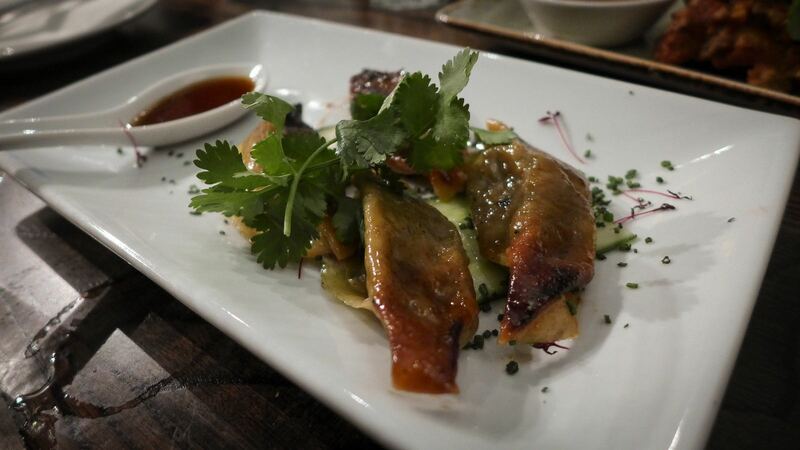 We tried a couple of variations on the theme of dumpling. Wild mushroom pot-stickers had good earthy flavour but were few enough to cause me to wonder if some were still attached to the pan. 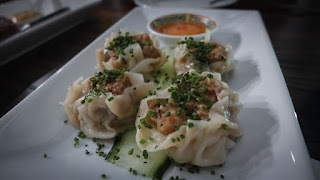 Steamed pork and prawn sui mai were nicely made, and were lent some guttural funk by a fish sauce based dip. 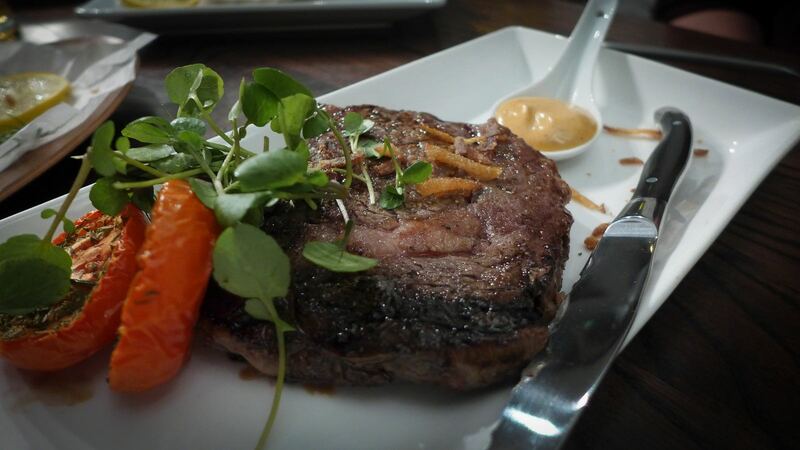 Best of the lot was a rib-eye steak which, despite not bearing the scars of a truly ferocious grill, was properly seasoned, had excellent flavour and was gloriously tender. A punchy “gunpowder” mayo went well with it, although it arrived on an annoying china spoon. I hate china spoons almost as much as I hate square plates, wooden planks and slate. 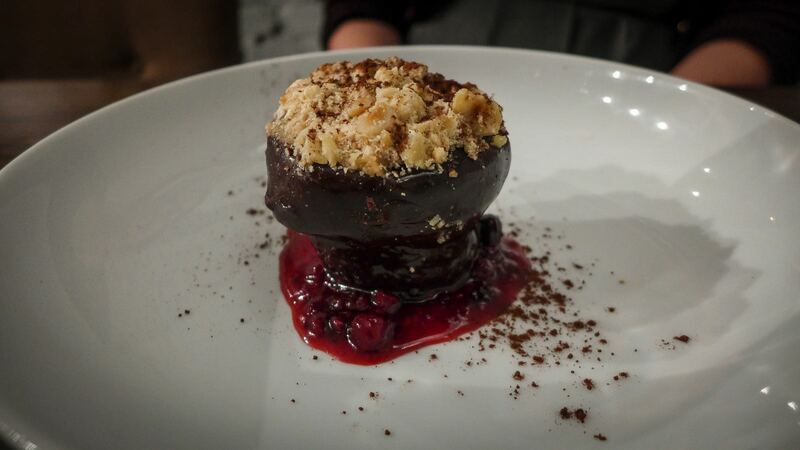 If the savoury dishes had been a slightly mixed bag, desserts were uniformly delicious. 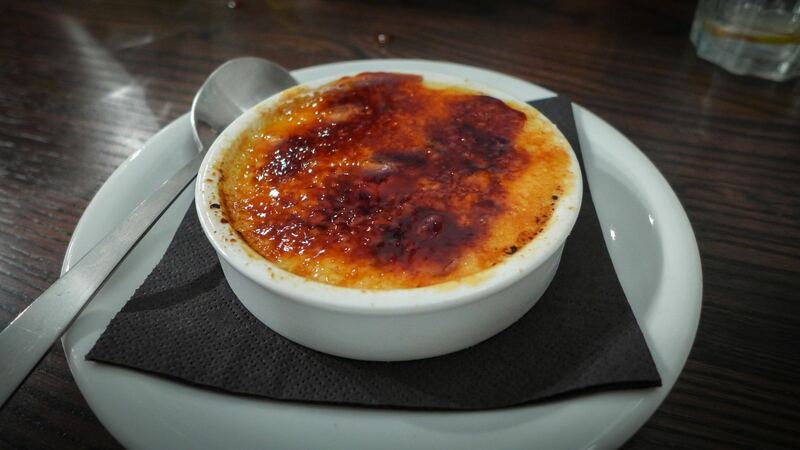 My mango and blackberry brûlée was well made, the burnt sugar/custard ratio being just so. Both the chocolate torte and frozen coconut crème Chiboust were equally good, providing an enjoyable coda to proceedings. 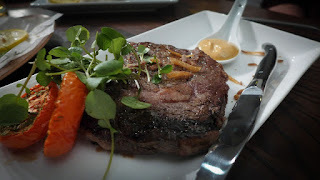 A bill of just over £81 seemed reasonable, considering the quantity we consumed between the three of us, and I noticed that the restaurant offers a special deal of £25 for 10 tapas chosen by the chef, plus a glass of Prosecco. The bill might have been higher had there been more than one white wine, an unremarkable Portuguese number, available by the glass. One of the important features of tapas bars is a good wine-by-the-glass list. This needs addressing. River Beat is one of those sites that has housed so many restaurants you can lose track. People in Newcastle have the artificial barrier of the Swing Bridge to cross, while Gateshead residents have the daunting prospect of an uphill walk home. I think this place is worth the trek in either direction, or will be when they’ve sorted out the niggles. The fit-out is neat and unfussy with painted brickwork (making a change from the ubiquitous exposed variety), and uncovered wooden tables. PR will be helped by the sole waiter on the weeknight we visited, who knew the menu inside out and was as welcoming as you could wish, despite being a very busy man. Once we get out of this awful winter, this will be a lovely spot to eat and drink, as there are excellent views across the Tyne to the Quayside. Special mention should be made of the children’s menu - not a regular feature of Asian restaurants. Aside from the fish goujons and cheeseburger, there’s a dippy duck egg with fresh cut chips and a thyme and parmesan chip butty. Junior Diner would approve. Chef/owner Andy Drape, a veteran of Blackfriars and The Stand, also used to ply his trade in the now defunct (and, for me, underwhelming) Barn Asia, and the menu here shares that place’s wild eclecticism. I wondered how a small kitchen team would be able to cook 22 separate tapas dishes, and although everything came out impressively promptly, the slightly uneven quality provides the answer. 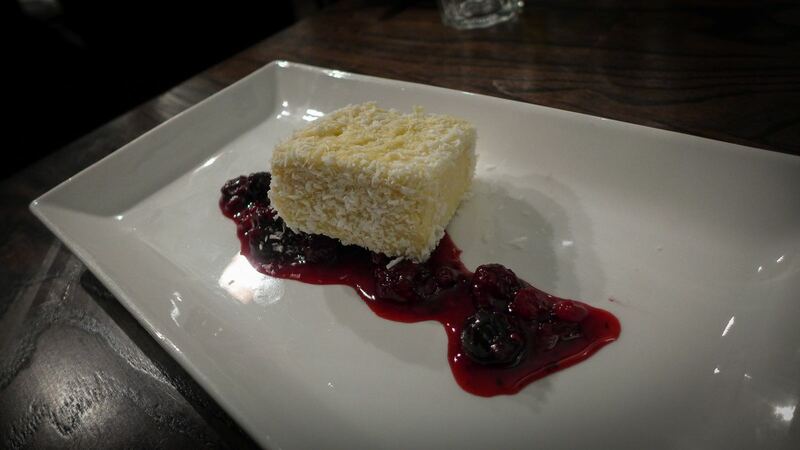 Still, an enjoyable meal, an interesting menu and a restaurant with promise. It’s also different, and that’s rare in this region.